The room I’m sitting in has a bizarre, spartan atmosphere. There is a mountain of boxes still waiting to be unpacked, but I have managed to shove them out of sight and out of mind for the time being. I love being in a new space, but hate the actual moving part. This means I tend to put the proverbial cart before the horse, scribbling garden plans and designing the label for our house ale before I can even find a hairbrush (I am, sadly, serious…but who am I kidding, it’s not like I brush my hair very often anyway). The kitchen, however, is one place that is unpacked and has been in use since our first morning here. Moving in with someone, no matter how intimately you know them, brings small discoveries of how you live and function. I find us having discussions about homemaking and what it means. One central tenet for both of us is the idea of waste reduction— but, lo and behold, the fridge is already full of the gummy ends of pots of brown rice, greens threatening to wilt and mildew, and a parmesan wedge, spreading a discolored hardness down to the rind. The oddballs of the fridge; the leftovers of staples I always have on hand but can very easily escape my best efforts not to waste. This “gratin” (though perhaps not a gratin in its purest sense) is perfect for making good use of the stragglers. Dishes like this always amaze me: for all their economy and little effort to assemble, they can come together to be the best dinner you have all week. The yogurt topping was inspired by a Martha Shulman New York Times recipe, and it is so awesome despite sounding a little strange, initially, to me. I’ve been spreading it over any number of casserole-ish dishes. Oil a 3-4 quart baking dish. In a large skillet, heat the oil over medium heat. Add the shallot and garlic and cook, stirring a bit, until the shallot begins to become translucent and aromatic, about 3-5 minutes. Add the chopped greens and give a few quick stirs to coat in the oil and allium mixture. Remove from heat. In a large mixing bowl, mix the grains, the greens mixture, and 3/4 cup parmesan. Taste for salt and pepper and season if necessary. Then, stir in just one of the eggs and mix until well incorporated. Spread the mixture in an even layer in the prepared baking dish. In another bowl, mix the yogurt, remaining two eggs, and remaining 1/4 cup parmesan. Throw in a few pinches of paprika if you want. Spread this mixture in an even layer over the grains and greens. Bake, 35 minutes or so, until the egg-yogurt topping sets and becomes speckled brown. Serve hot. This “gratin” looks absolutely delicious! This looks so good! I hope you are very happy in the new house (and that the labels turn out well; the hair will, of course, be fine:-). You’re right! Thanks for the catch, Jennifer, it’s fixed now. Glad to find you happy in your new place. I think you have your priorities about right. Kitchen, garden, hair. The gratin looks great. The top looks custardy. Is it? 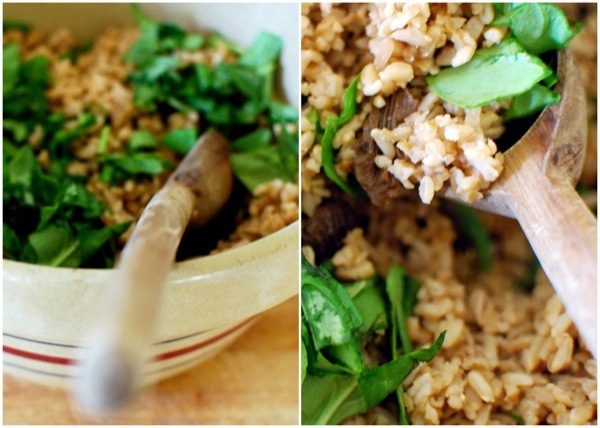 I hardly ever have any leftover grains kicking around (I’m not in the habit of making more than enough for one meal). Celery is what languishes in my crisper. Have any bright ideas for that? It is kind of custardy. Hard to explain. It’s a revelation, I love it, especially with a little paprika thrown in. This sounds awesome. We are trying to eat veg this month, but my husband still needs heft and richness to his meals. I think this might satisfy both of us. Happy moving in — how fun to really start a new year together! I discovered your blog last week, and I just love it… Beautiful design & photos and your recipes make me want to come eat at your house! Does this mean no more yellow house?? Moving in with someone is most definitely an experience to say the least…growing pains may be the most diplomatic way to put it :) This recipe looks just divine…perfect for cold winter nights and using up leftovers! Ha…I’ve been anticipating that question. (You’d be surprised at how many real-life friends, upon hearing that I’m moving, first asked “But what about your blog! ?”) In short, the concept of the yellow house is still alive and well. I think that concept just outgrew its former digs. You can expect the same type of site; don’t worry. This dish sounds (and looks) great! I love Martha Schulman’s column in the Times. She has some great ideas there. She does have good ideas. Straightforward and good. Refreshing, compared to long-winded writers like me ;) Thanks for stopping by, Jenna! I’m definitely making this tomorrow, gumbo tonight means that there will be a glut of fridge-bound brown rice needing a place in the world. Unpacked or not, your new place looks and sounds lovely, Sarah. Same with this dish– not your average grain dish any more than it’s your average gratin! I especially love the yogurt topping idea. Best of luck settling in and very best wishes as you start this next phase of your life! I am so on board with this browned yogurt topping. I love Martha Shulman’s recipes. Thank you for bringing her yogurt topping concept to my attention! Your gratin looks marvelous. you end up learning SO much about communicating with each other, huh? This looks insane. I make a similar dish (like you, i HATE waste! ), but can never get it quite pretty enough to photograph. Yours if gorgeous and I must try that topping, sounds delicious, my friend. Made this for lunch today and it was wonderful. I loved the way the top was both custardy but had a tang from the yogurt. Do you think that if I did not have grains this could work with just the greens and the yogurt top and then spread on crackers or somethink like a dip? Katie! :) I don’t see why not. I’m glad that you tried it. The yogurt is really different, but really good. Maybe throw in some more cheese to make it dip-pier. Just came across your blog via Tea & Cookies… I can’t wait to look through the archives, it all looks so lovely! Looking forward to making this gratin next time I have leftover grains- it looks absolutely delicious! Hi Charlotte! I hope you’re not disappointed; I just saw Tea’s write-up and it made me seem way cooler than I am :) Thanks for stopping by. Another Charlotte who found you from Tea and Cookies. This looks delicious and right up our street. And the topping looks and sounds amazing – and healthier than my current go-to topping which I pinched from a moussaka recipe. This dish sounds fabulous, and exactly what I love: healthy grains and greens, and a gratin-like, decadently brown crust. Can’t wait to try it this weekend. This could very well become my new favorite comfort food. sorry for commenting on such an old post–i’ve had this bookmarked forever and just decided to make it tonight for my family! this was amazing. yogurt topping? i was pretty skeptical at first, but i loved it. i want to put this on top of everything! thanks for posting! Yes late post here as well. But I really love this when I have lots of eggs and a garden full of silverbeet. I often come back to it. There is something very comforting about the combo. Many thanks. You are currently reading Greens & grains gratin with browned yogurt topping at The Yellow House.